Download "Cross-beam scanning system to detect slim objects. 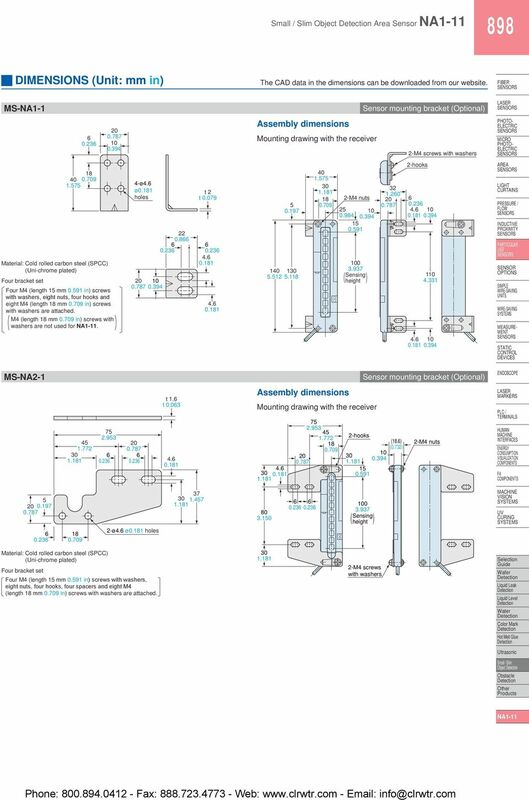 100 mm 3.937 in"
1 891 Object Area Sensor General terms and conditions... F-17 Related Information Glossary of terms... P.1359~ Sensor selection guide...p.831~ General precautions... P.1405 PHOTO PHOTO Conforming to EMC Directive Recognition (Excluding 5 m cable length type) Make sure to use light curtains when using a sensing device for personnel protection. MEASURE PNP output type available Cross-beam scanning system to detect slim objects Letters or business cards detectable! 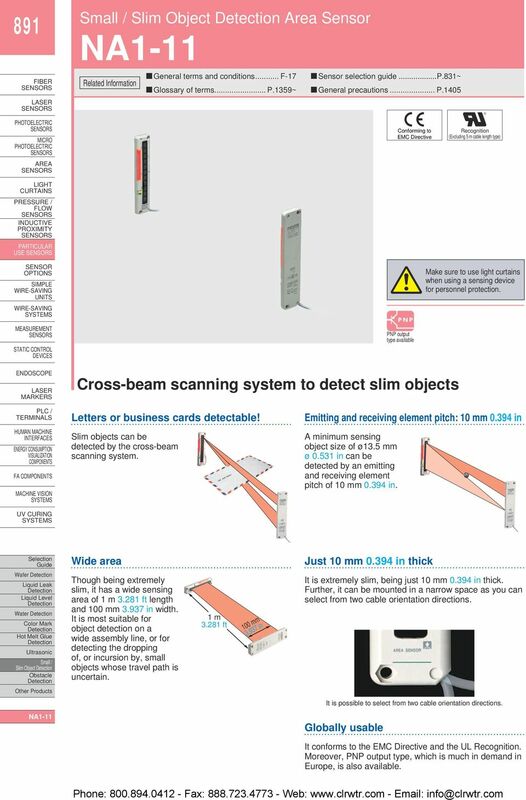 Slim objects can be detected by the cross-beam scanning system. Emitting and receiving element pitch: mm in A minimum sensing object size of ø13.5 mm ø in can be detected by an emitting and receiving element pitch of mm in. Wide area Just mm in thick Small / Slim Object Though being extremely slim, it has a wide sensing area of 1 m ft length and mm in width. It is most suitable for object detection on a wide assembly line, or for detecting the dropping of, or incursion by, small objects whose travel path is uncertain. 1 m ft mm in It is extremely slim, being just mm in thick. Further, it can be mounted in a narrow space as you can select from two cable orientation directions. 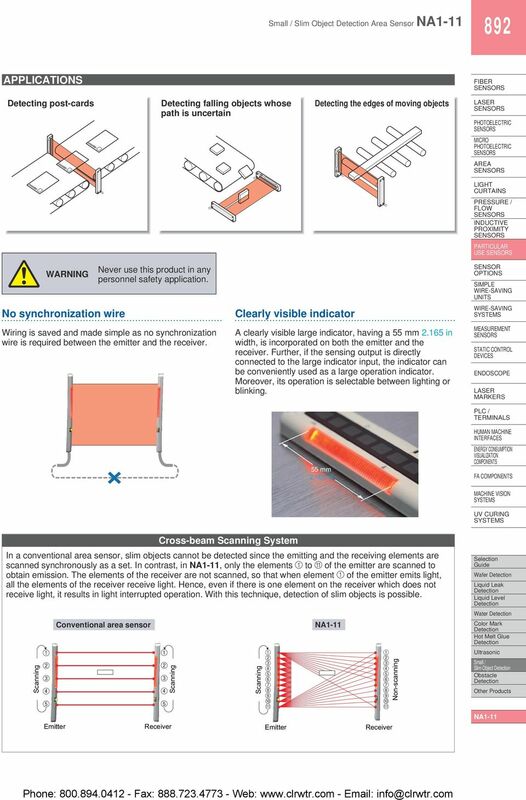 It is possible to select from two cable orientation directions. Globally usable It conforms to the EMC Directive and the UL Recognition. Moreover, PNP output type, which is much in demand in Europe, is also available. 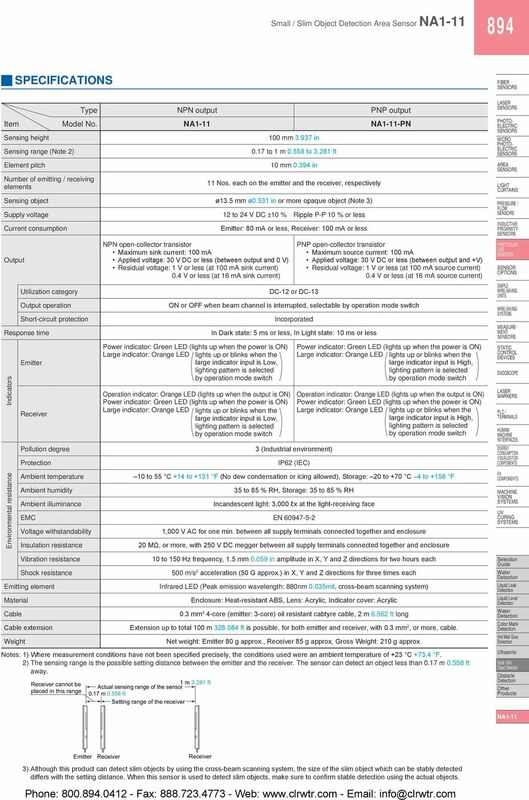 3 893 Object Area Sensor ORDER GUIDE Type Appearance Sensing range (Note1) Model No. (Note2) Output NPN output 5 m ft cable length Sensing height: mm in No. 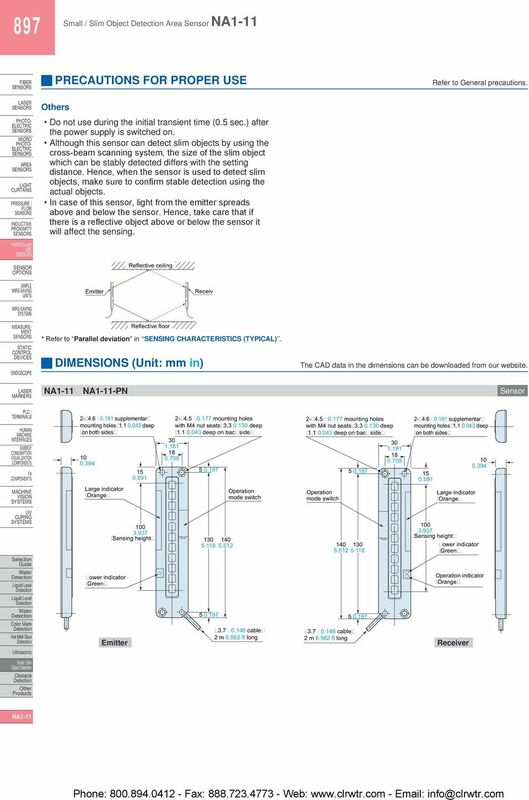 of elements Element PNP output per emitter / pitch: mm -PN PNP open-collector transistor receiver: in Notes: 1) The sensing range is the possible setting distance between the emitter and the receiver. The sensor can detect an object less than 0.17 m ft away. cannot be placed in this range 1 m ft Actual sensing range of the sensor 0.17 m ft Setting range of the receiver 0.17 to 1 m to ft -C5 NPN open-collector transistor 2) The model No. with suffix P shown on the label affixed to the product is the emitter, D shown on the label is the receiver. (e.g.) of : P, of : D Designation Model No. Description Sensor mounting bracket MS-NA1-1 MS-NA2-1 Four bracket set Four M4 (length 15 mm in) screws with washers, eight nuts, four hooks, four spacers and eight M4 (length mm in) screws with washers are attached. (Spacers are not attached with MS-NA1-1.) Sensor mounting bracket MS-NA1-1 M4 screws with washers, nuts and hooks are attached. MS-NA2-1 Object M4 screws with washers, nuts, hooks and spacers are attached. 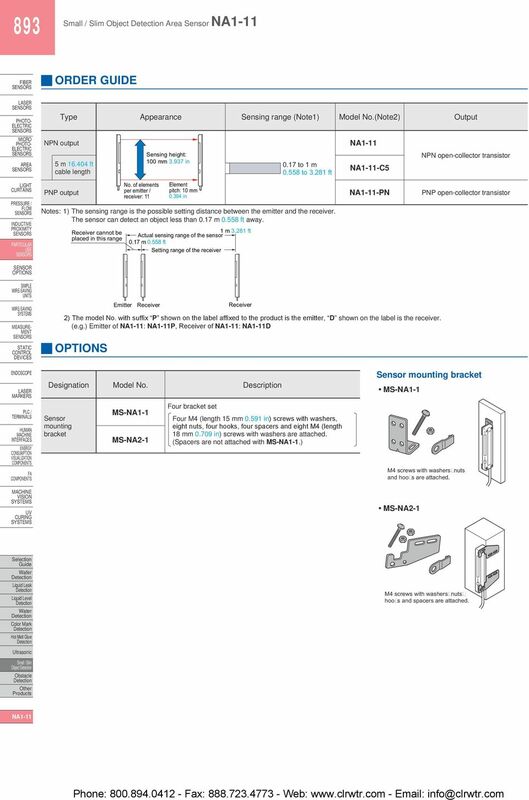 4 Object Area Sensor 894 SPECIFICATIONS Type NPN output PNP output Item Model No. 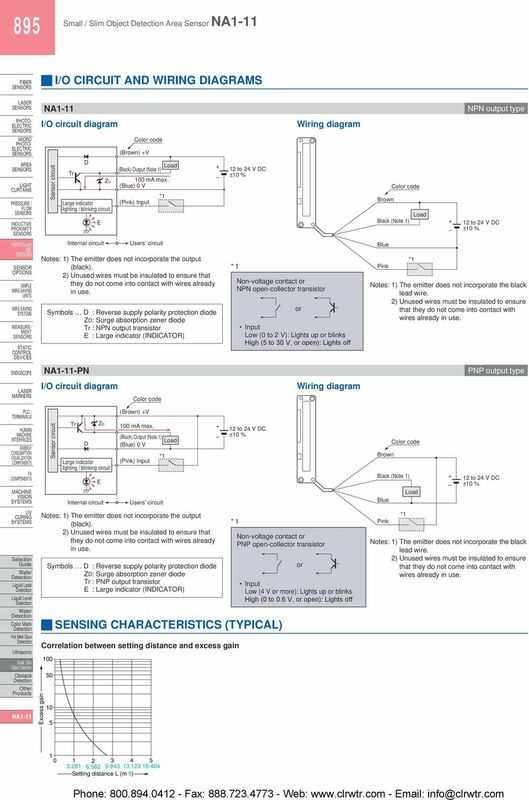 -PN Sensing height Sensing range (Note 2) Element pitch Number of emitting / receiving elements mm in 0.17 to 1 m to ft mm in 11 Nos. each on the emitter and the receiver, respectively Sensing object ø13.5 mm ø0.531 in or more opaque object (Note 3) Supply voltage Current consumption Output Utilization category Output operation Short-circuit protection Response time Indicators Environmental resistance Pollution degree Protection NPN open-collector transistor Maximum sink current: ma Applied voltage: V DC or less (between output and 0 V) Residual voltage: 1 V or less (at ma sink current) 0.4 V or less (at 1 ma sink current) 12 to 24 V DC ± % Ripple P-P % or less : 80 ma or less, : ma or less DC-12 or DC-13 PNP open-collector transistor Maximum source current: ma Applied voltage: V DC or less (between output and +V) Residual voltage: 1 V or less (at ma source current) 0.4 V or less (at 1 ma source current) ON or OFF when beam channel is interrupted, selectable by operation mode switch Power indicator: Green LED (lights up when the power is ON) Large indicator: Orange LED lights up or blinks when the large indicator input is Low, lighting pattern is selected by operation mode switch Operation indicator: Orange LED (lights up when the output is ON) Power indicator: Green LED (lights up when the power is ON) Large indicator: Orange LED lights up or blinks when the large indicator input is Low, lighting pattern is selected by operation mode switch Incorporated In Dark state: 5 ms or less, In Light state: ms or less 3 (Industrial environment) IP2 (IEC) Power indicator: Green LED (lights up when the power is ON) Large indicator: Orange LED lights up or blinks when the large indicator input is High, lighting pattern is selected by operation mode switch Operation indicator: Orange LED (lights up when the output is ON) Power indicator: Green LED (lights up when the power is ON) Large indicator: Orange LED lights up or blinks when the large indicator input is High, lighting pattern is selected by operation mode switch Ambient temperature to 55 C +14 to +131 F (No dew condensation or icing allowed), Storage: 20 to +70 C 4 to +158 F Ambient humidity Ambient illuminance 35 to 85 % RH, Storage: 35 to 85 % RH Incandescent light: 3,000 lx at the light-receiving face EMC EN Voltage withstandability Insulation resistance Vibration resistance Shock resistance Emitting element Material Cable Cable extension Weight Notes: 1) Where measurement conditions have not been specified precisely, the conditions used were an ambient temperature of +23 C F. 2) The sensing range is the possible setting distance between the emitter and the receiver. The sensor can detect an object less than 0.17 m ft away. cannot be placed in this range 1,000 V AC for one min. between all supply terminals connected together and enclosure 20 MΩ, or more, with 250 V DC megger between all supply terminals connected together and enclosure to 150 Hz frequency, 1.5 mm in amplitude in X, Y and Z directions for two hours each 500 m/s 2 acceleration (50 G approx.) in X, Y and Z directions for three times each Infrared LED (Peak emission wavelength: 880nm 0.035mil, cross-beam scanning system) Enclosure: Heat-resistant ABS, Lens: Acrylic, Indicator cover: Acrylic 0.3 mm 2 4-core (emitter: 3-core) oil resistant cabtyre cable, 2 m.52 ft long Extension up to total m ft is possible, for both emitter and receiver, with 0.3 mm 2, or more, cable. 1 m ft Actual sensing range of the sensor 0.17 m ft Setting range of the receiver Net weight: 80 g approx., 85 g approx, Gross Weight: 2 g approx. Object 3) Although this product can detect slim objects by using the cross-beam scanning system, the size of the slim object which can be stably detected differs with the setting distance. When this sensor is used to detect slim objects, make sure to confirm stable detection using the actual objects. Small U-shaped Micro Photoelectric Sensor. Enables space saving and quick installation! E3FS. Safety Photoelectric Switch. Safety design for category 2. Suitable for detecting human bodies in hazardous area. Sensing method Appearance a Connection o method Sensing distance Model NPN output PNP output Through-beam Pre-wired (see note 3) Connector. Compact Pre-wired Photomicrosensor with Built-in Amplifier (Non-modulated) CSM DS_E_7_2 Meeting Customer Needs with Compact Sensors that Mount with M Screws Both light-on and dark-on outputs provided. 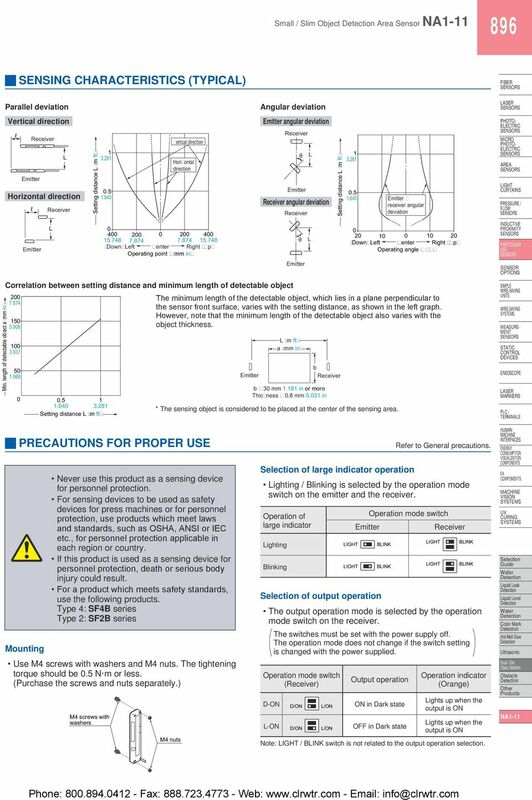 No.LV31JE2 2008.05 To prevent accidents arising from the misuse of this instrument, please ensure the operator receives this manual. Features. 3.5 mm flat model with background supression (BGS) with highest repeatability even for differently coloured objects. Relays & Sockets. RF1V Force Guided Relays/SF1V Relay Sockets. Certification Organization/ File Number. UL/c-UL File No. Compact Photoelectric Sensor with Built-in Amplifier EZ-LS CSM_EZ-LS_DS_E_9_ Distance-settable Sensor Unaffected by Workpiece Color and Background Distance-settable triangulation model unaffected by color. ONE OF THE SMALLEST SNAP-ACTION SWITCHES IN THE WORLD. FEATURES Superminiature type, light-weight snap action switch PC board terminal type (0. Appearance Type Setting distance Sensing area Model Remarks Camera with lighting. 34mm to 49mm 5mm x 4.9mm to 9mm x 8.